Since 2006, phone bills have become 52% higher for the average subscriber. Some could point to the amount of data people are consuming and that carriers are having to constantly upgrade equipment to fulfill the needs of their customers or that rising costs in general are to blame or acquisitions and purchases of spectrum for that new network are the cause. 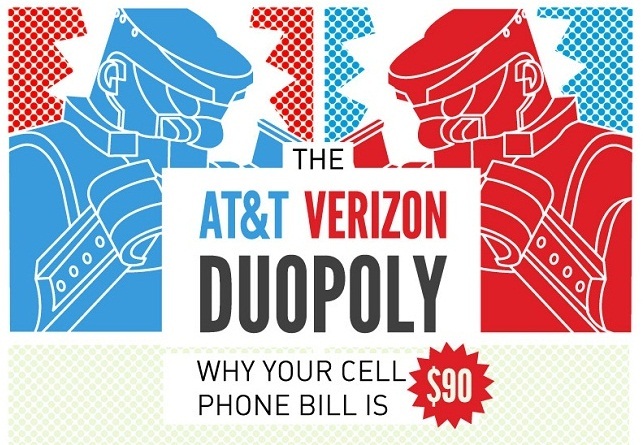 After taking a peak at this newest infographic, you get a sense that the folks at The Simple Dollar are willing to bet that these rising costs have to do with what they are calling a “Duopoloy” in the wireless arena between AT&T and Verizon and nothing more. Check it out below. Samsung CEO and Apple's Tim Cook to Have Court-Requested Meeting, Could this Be An End to the Patent Wars?